2. Coumba Toure is a feminist, writer, artist and human rights activist. Born in Mali and based in Senegal she is a leading change-maker in youth educational development and social entrepreneurship. Her activism includes writing children’s books as tools to build a community that supports young people in creating their own learning tools and social change projects. Coumba also works to develop leadership amongst girls and women on the African continent and in the Diaspora – skills and experience she will call on in here role organizing and mobilizing artists, activists, women and youth movements for social change. She designs and produce a range of education material and programs for children and young people (books, clothes, games) through Falia artist collective and production house. She has and extensive experience in facilitating meetings, engaging young people, and designing and implementing and evaluating programs promoting peace and justice specially for women. She is a certified coach and a strong public speaker. She has more than twenty years of experience working with organizations such as Ashoka supporting social entrepreneurs globally, the Institute for Popular Education in Mali designing alternative education programs, the 21st century youth leadership movement in Selma Alabama connecting Africans across continents, and Youth for environment sanity in California support leadership training for young. 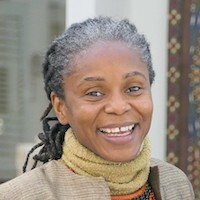 She is a member of the African Feminist Forum as well as the Per Ankh writers cooperative. She is a member of African Consultant International board. She is a mother and a sister to many.